LATI staff members have been addicted to Tally Ho!. The simple base-beat and catchy cue and tag rhythms provide a compelling scaffold for improvisation. Empowering individual creativity through both rhythmic modulations and slant choreography, the piece is useful in a variety of settings including LATI's CicLAvia and Farmers' Market performances. This course is fun and challenging for players of all experience levels, teaching the essentials of Tally Ho!, plus the newest moves and grooves from the LATI staff. Motivated students can request to participate in the LATI staff performance at the Torrance Farmers' Market, Tuesday June 02. 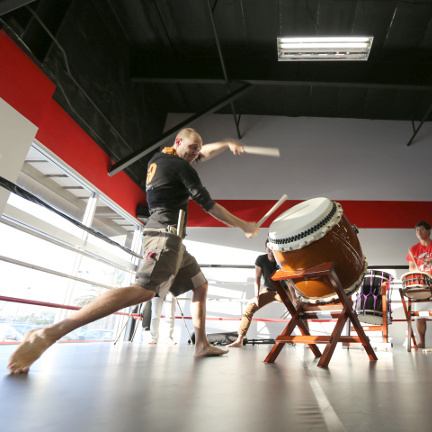 Note that there is no class June 14 for North American Taiko Conference. After the break, the course resumes and completes a full, 12 classes.